Thanks to the university’s Office of Sustainability and Energy Management, nearly all of the materials, from light fixtures and seating to the brick and mortar, are being recycled or repurposed as a means of preventing them from ending up in landfills, said Chief Sustainability Officer Lauren Bishop. Those efforts begin internally. Bishop said her office reaches out to various shops across campus, such as housekeeping, to see if there are items they may need. For instance, housekeeping was able to utilize paper towel holders and soap dispensers during the demolition of Niggli Theatre. Facility management’s lock shop and HVAC shop were able to repurpose door hardware and a ceiling heater, while Residential Living was the beneficiary of some LED light fixtures. Movable non-fixture items that aren’t surplused are donated to local organizations. Habitat for Humanity was the recipient of doors, light fixtures, filing cabinets, shelving and furniture from the demolition of Graham Building. They also received light fixtures, sinks, and some theater props from Niggli, and auditorium chairs and rails from the first-floor renovation in H.F. Robinson Administration Building. As the Niggli demolition was taking place, a memory came back to Bishop from her May 2017 WCU Leadership Tour visit to the Folkmoot Friendship Center in Waynesville. She remembered that, after refinishing the floors in their auditorium, Folkmoot officials had been unable to retain most of their old seating.Bishop reached out to Folkmoot Executive Director Angie Schwab to see if she would be interested in receiving the theater seats from Niggli. Schwab was more than grateful. “We’ve been looking for suitable chairs for some time, and were delighted to get a call from WCU’s sustainability program with an offer of theatre chairs from Niggli,” Schwab said. “As a nonprofit, we get a lot done with dedicated volunteers and make every dollar count. 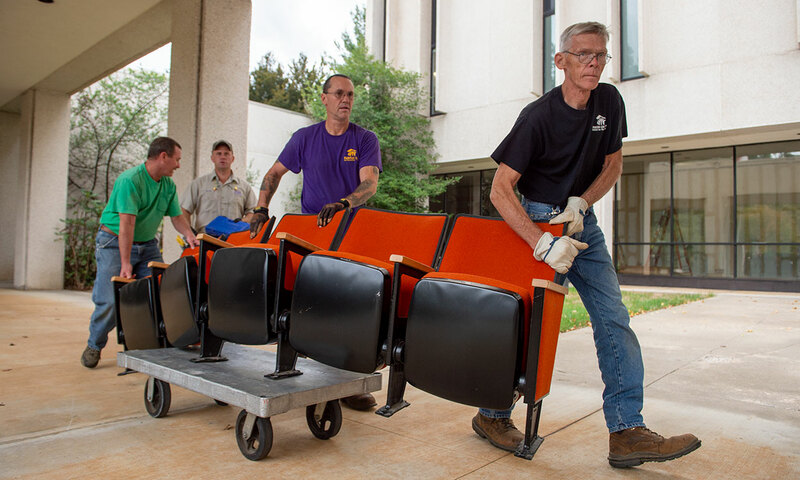 With the donation of 140 auditorium seats, WCU is saving Folkmoot thousands of dollars and helping us meet our goal of being a valued cultural entertainment venue for our region. Even the building materials are finding their way into the recycling stream. WCU recycling coordinator Jeff White said outside contractors are required to fill out a form showing materials that are going to recyclers. WCU is able to recapture a small profit from some metals, which are taken to Metal Wood Recycling in Sylva. Large quantities of materials are sent to Asheville’s Biltmore Iron and Metal Company, where the university has a state contract. White said concrete and brick can be ground, with the metal separated from it, and used as aggregate for building materials for such things as a sub-base for new roadways. Unfortunately, the university wasn’t able to recycle many materials from the current renovation of Moore building due to the discovery of asbestos, White said. For every ton of materials WCU is able to pull out of the waste stream to recycle, the university saves $64. Since the fiscal year 2015-16, WCU has saved more than $40,000 in landfill costs, White added.